A while back, a good friend emailed me and said that she’d ordered a cookbook that turned out to be not quite her style and she wondered if I might want it? It was called Jamie Oliver’s Comfort Food. Oh yes! I certainly did want it! I’d been looking at it on Amazon and had almost ordered it a few days earlier. I could hardly wait to get my hands on that book. Not only do I enjoy Jamie Oliver, I really, really love the fabulous photographer, David Loftus, who makes all of his food look so fantastic. To be honest, I wanted the cookbook as much to learn from the photography as to make the recipes. When the book arrived, I sat down just to browse for a few minutes and the next thing I knew it was two hours later and I’d been completely absorbed in this lovely volume that presents all the best comfort foods from around the world. 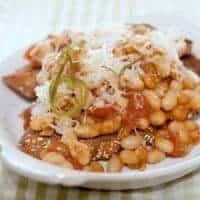 I started with this slightly tweaked recipe for Beans on Toast, a perennial favorite in English homes. It’s really just good old baked beans served over toasty whole grain bread and topped with cheddar cheese. We found it quite delicious, hearty, and comforting and I hope you do, too! Start by making the optional jalapeno-rosemary oil. Thinly slice the jalapeno removing the seeds if desired for a mild result. Remove the rosemary leaves from the stalks. 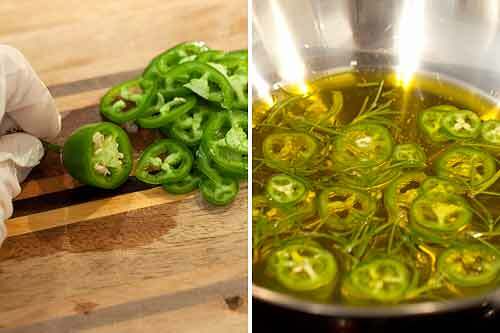 Put the jalapeno slices and rosemary in a small saucepan or skillet with just enough olive oil to cover. 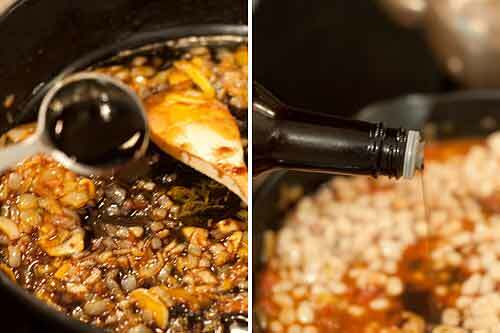 Place over a very low heat for about 20 minutes to allow the flavors to infuse. Remove from the heat and set aside. Place an oven-proof skillet over medium low heat. Add 2-3 tablespoons of the jalapeno-rosemary oil (or plain oil) along with the garlic, onion, paprika, and brown sugar. Cook, stirring frequently, until the garlic and onion have softened (about 10-15 minutes). Add the balsamic vinegar and Worcestershire sauce and cook for another couple of minutes. Add the cannellini beans and tomatoes (which you will need to crush or chop) along with their juice. Cook for an additional 5 minutes. 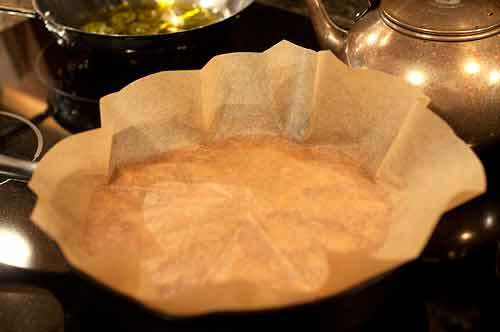 Cut a circle of parchment paper to fit the skillet and place it on top of the beans. Transfer to skillet to oven and bake for approximately 1 hour or until quite thick. When ready to serve, toast the bread and spoon over the beans. Top with finely grated cheddar cheese and a drizzle of the jalapeno-rosemary oil. 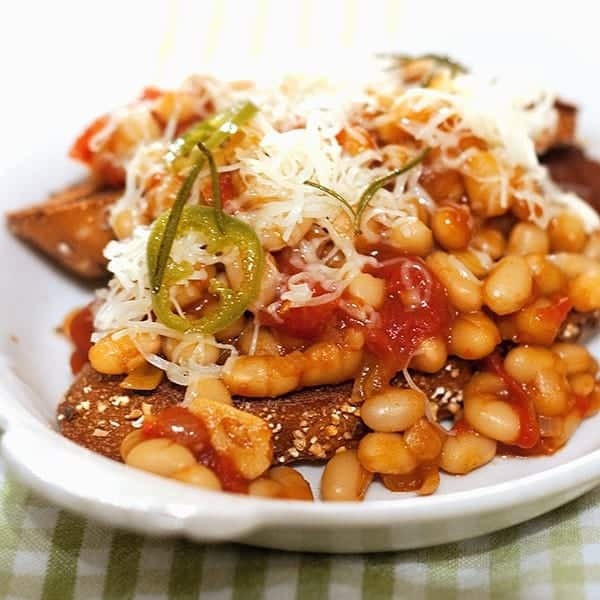 Yummy oven-baked beans on toast with a spicy jalapeno-rosemary kick. Preheat the oven to 325 degrees. Place an oven-proof skillet over medium low heat. Add 2-3 tablespoons of the jalapeno-rosemary oil (or plain oil) along with the garlic, onion, paprika, and brown sugar. 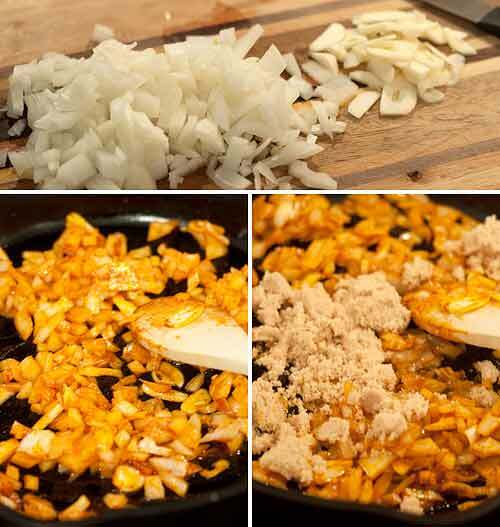 Cook, stirring frequently, until the garlic and onion have softened (about 10-15 minutes). Add the balsamic vinegar and Worcestershire sauce and cook for another couple of minutes. My husband and I laughed when we saw this recipe. We are both from England and wondered what our parents would have thought about the recipe. It sure is a long way from opening a can of Heinz beans. I just love your recipes, anything from the South I seem to like even though we have lived in Canada for the past 56 years. Thank you…I think? Yes, it’s a bit more complicated than opening a can, but not much and it is so, so good! Sounds like a really good cookbook! I’ll have to get my hands on this one. Great recipe!! It’s a beautiful book and all the recipes look delicious! Oh my gosh. I need this stat! This has our name on it. Love everything about it – okay the family cannot take the spice kick, but beans and toast. So lovely. Bea – the jalapeno is totally optional. If your family wouldn’t like the spice, just use plain oil and skip the jalapeno. You’re welcome, April! Yours looks wonderful. 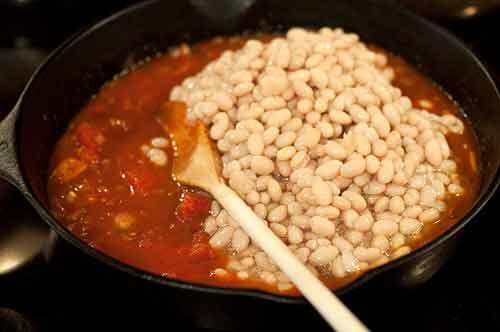 Beans on toast is one of my favorite high-protein/high-fiber meal that can be whipped up quickly. And you can never go wrong with a Jamie Oliver recipe. Right, Dara! Quick, easy, delicious and good for you to boot. And I agree about Jamie Oliver’s recipe. Always dependable. Sounds like a great cookbook! I’m going to look into it. I find this bean dish so comforting. And that kick of jalapeño rosemary oil must be amazing. I really think the jalapeno-rosemary oil puts it over the top. It’s still good without it, but excellent with it! How can comfort food not be anyone’s style?! ;) And this looks great. Cookbook sounds good, too! It’s a very good cookbook, Erin, with comfort food dishes from all around the world. I’m sure you’d enjoy it! This is my parent’s Friday night dinner…every Friday night. :-D It is deeeelicious!! Such simple, rustic ingredients (plus a zesty kick from the jalepenos!) – Looks great! My friends from England love beans on toast! I love the jalapeno oil kick. So what does the parchment paper do? Keep the beans moist? Yes, it acts something like a lid but keeps it even more moist since it’s in contact with the surface of the beans. Perhaps this is a good time for a technique lesson. You could expound on the various uses of parchment paper. I use it nearly daily. What other uses do you find helpful?